Coriander leaves are also called cilantro. It is a herb commonly used for flavoring and garnishing the dishes. Coriander leaves are rich in Vitamins-A, C, and K. They also contain small amount of calcium, iron, thiamin, riboflavin, folic acid. According to UK Natural Therapies website "The coriander leaves contain natural antihistamines, Vitamin-C and bioflavonoids. The juice that is extracted from the coriander leaves can be used as a topical application for the treatment of allergies and skin diseases like eczema and fungal infections. Coriander is also effective in reducing allergic reactions such as hay fever." Apart from using it for flavoring and garnishing the dishes, we can include coriander leaves in our diet in the form of coriander chutney, coriander rice, podi etc. This is a very flavorful podi, which we all love at home with hot rice drizzled with ghee/sesame seed oil. 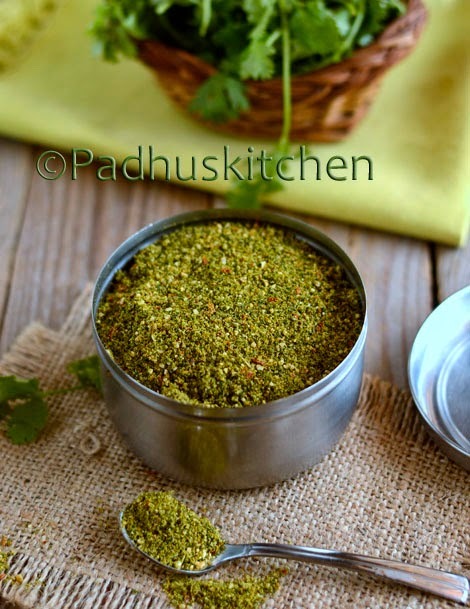 Today we will learn how to make kothamalli podi following this easy recipe. Wash coriander leaves well and drain the water completely. Chop it finely along with the stem.You can use the tender stem also for this recipe. Spread it on a cloth and dry the coriander leaves in the shade for 6-7 hours. After drying, I got 2 cups of coriander leaves. The color of the leaves will remain green even after drying for 6-7 hours in the shade. Heat 1/2 tsp of oil and fry the red chillies and hing for a few seconds and remove it. Then in the same pan, fry both the dals (channa dal + urad dal) together until dal turns golden brown. Fry the coriander leaves on low flame until all the moisture from the leaves evaporates. Grind everything together adding salt needed to a coarse powder. It will take time to get a coarse powder as shown in the picture above. So be patient and grind leaving a gap of 5-10 minutes in between to prevent the mixer from getting heated. Store it in an airtight container at room temperature. If you feel that there is moisture in your podi, store it in the refrigerator. It will stay fresh for 15-20 days. Enjoy with hot rice topped with a tsp of ghee or sesame seed oil. Very flavourful and fantastic podi, i can have this podi happily with some rice. Such a warm color of the podi. Love your recipes! That's a delicious powder to store and use... I have never done coriander one. Nice..
lovely colour of podi and a very useful post. Have tried mint powder but not coriander powder. Will try this. Very nice sis. Thank u for very health dish sis..
Podi looks colourful...yummy to go with steamed rice..
Hi can I use yellow splits , I understand this Is split peas and not Chana dal,instead of chana dal in this recipe ? And also can I substitute this yellow splits for chana dal in a recipe like for adai, paruppu usili etc ? No, use only chana dal or kadalai paruppu for best results. Will it take a long time to roast the coriander since we are not using completely dried coriander. Hi.. I tried this as I accidentally ended up with a lot of coriander leaves at home.. Wanted a recipe that I could use to preserve them. But it came like a thick thogayal n not a podi. So, can you tell me what I did wrong? The coriander leaves should be dried well in shade and you must add the mentioned dal quantity.I assume that the coriander was not dry enough that is why you have ended up in thick thogayal. No, you should not put it back in the fridge. It will become perfect once you grind it with all the dal.